The leaves are changing color, there is a crisp breeze in the air, and pumpkin spice is everywhere. These are all sure signs of one thing - Autumn is here! This rich, creamy, and flavorful soup is sure to become a Fall favorite. 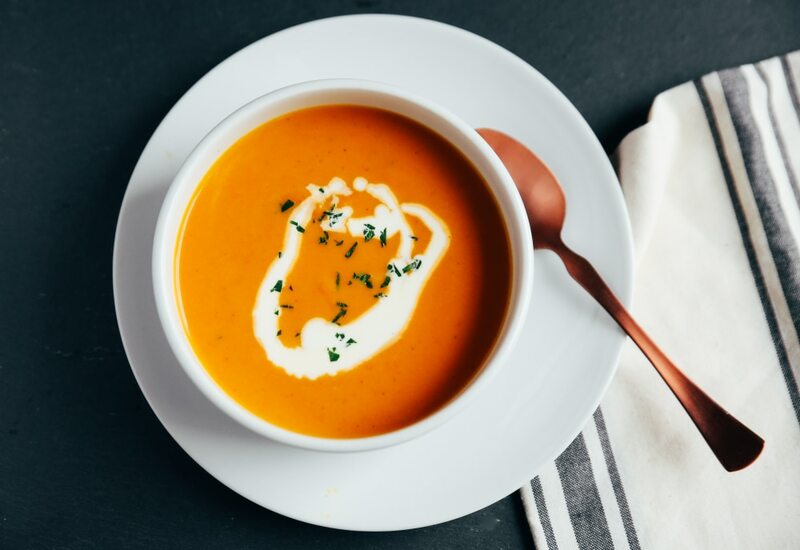 Use your MultiPot pressure cooker to get tender fresh pumpkin in a matter of minutes for a rich, savory soup ready in under half-an-hour. White pepper, nutmeg, cloves, cinnamon, and ginger create a spice blend that is the signature flavor of the season. Using an immersion blender creates a restaurant-quality velvety smooth soup. All pumpkins are edible, but some varieties are best for cooking while others are best for carving. Look for varieties such as Baby Bear, Baby Pam, Cinderella, Fairytale, Long Pie, and Winter Luxury pumpkins. Not only do they have fun names, but they are best for cooking and eating! Per Serving: 184 calories; 17g fat; 7.4g carbohydrates; 2g protein; 45mg cholesterol; 827mg sodium. We really liked this when it was cooking because the house smelled amazing, but when you actually tasted it, it was really pepper-front and the pumpkin spices got entirely lost. Looking forward to round two, when I will be doubling the nutmeg and clove, greatly increasing the cinnamon and replacing at least some of the black pepper with chipotle chili powder. Very strong base here. Tempted to drop roasted potatoes into this, too. You could thin it a bit with more stock and use it as a base for rice noodles in a bastardized pho, too. Really, there are a lot of ways to go with this if you treat it as a starting point. If you like pumpkin spice, you will go crazy for this dish. I've put my pressure cooker to use so many times this fall, but this is definitely one of my favorite recipes to date. I love all of the rich and savory flavors, this is good enough to be on a restaurant menu. I loved this delicious pumpkin spice soup. It's so perfect for fall! I loved the onion flavors together with the spices. This is a great, healthy option for lunch or dinner and one of my favorite soup recipes. I used chicken stock instead of vegetable stock for this recipe, and skipped the cinnamon. I thought to myself there is no way this will quick in just 10 minutes, but it did! The immersion blender was perfect, and way easier than cleaning out my larger blender. I had no idea that some pumpkin varieties were better than others. I used Baby Pam. During the fall, I make this recipe a lot. I also use a yogurt drizzle instead of whipping cream. If you like the ginger flavors, I recommend adding extra. Ginger paste works really well.